PressBox says thank you to those who teamed up with us and our friends at Chesapeake Urology and Associates to make the Big Game on Feb. 3, 2019 pay off for some great local charities through the 2018-19 100 Block Charity Pool. The winners of each quarter, whose numbers matched the last digit of each team’s score, each won $3,000 for the charity of their choice. With the score 0-0 at the end of the first quarter, South Baltimore Network won $3,000 for The Transformation Center. With the score New England 3, Los Angeles 0 at the end of the second quarter, PressBox won $3,000 for Team Up For 1, and with the score 3-3 at the end of the third quarter and 13-3 at the end of the game, CountySportsZone.com won a total of $6,000 for the Doug Parker Memorial Scholarship. * No company or person may enter this pool to win prize money directly. All proceeds will be awarded to the charities in the names of the companies or persons purchasing the winning boxes. In the event of a tie in regulation, the fourth winner is determined by the final score. PressBox says thanks to those who teamed up with us and our friends at Chesapeake Urology and Associates to make the Big Game on Feb. 4, 2018 pay off for some great local charities through the 2017-18 100 Block Charity Pool. PressBox is proud that with this year's winners, we have passed the $100,000 mark in gifts over our eight years of working with our partners to give something back to our community. Top left: The South Baltimore Network's Kevin Anselmi poses with Kim Callari of The Baltimore Station. Top right: Westland Management Group's Bill West donated his winnings to Ravens Roost 15. Bottom: Thompson Chrysler Dodge Jeep Ram's Ron Filling poses with Marlyn Gambrill and Kerry Burns of Extreme Family Outreach. Not pictured: Jordan Zukerberg of Crossroads Interactive donated his winnings to Lucky Dog. * No company or person may enter this pool to win prize money directly. All proceeds will be awarded to the charities in the names of the companies or persons purchasing the winning boxes. For information on all rules and regulations, e-mail fanmail@pressboxonline.com. PressBox says thanks to those who have teamed up with us and our friends at Chesapeake Urology and Associates to make the big game on Feb. 5, 2017 pay off for some great local charities through the 2016-17 100 Block Charity Pool. PressBox Thanks Our 2015-16 Charity Block Pool Participants! 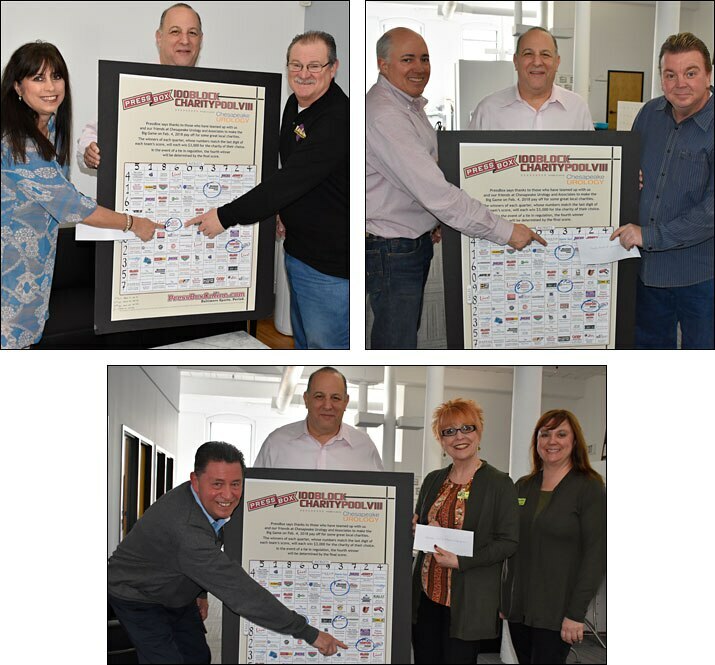 PressBox says thanks to the advertisers, friends and vendors who have teamed up with us and our friends at Chesapeake Urology and Associates to make the big game on Feb. 7, 2016 pay off for some great local charities through the 2015-16 100 Block Charity Pool. PressBox Thanks Our 2014-15 Charity Block Pool Participants! PressBox says thanks to those who have teamed up with us and our friends at Chesapeake Urology and Associates to make the big game on Feb. 1, 2015 pay off for some great local charities. Click here to see the 100 Block Charity Pool grid (pdf). PressBox Thanks Our 2013-14 Charity Block Pool Participants! PressBox invited advertisers, friends and vendors to participate in the 2013-14 100 Block Charity Pool. Charities listed in the four circled blocks -- one for each quarter of the big game Feb. 2 -- will receive $3,000 each on behalf of their block purchasers. Seattle's 43-8 victory against Denver may have made for a lousy spectacle, but it didn't diminish the event for our four winning sponsors and the causes they selected. Thanks to all for playing. Check out the final PressBox 100 Block Charity Pool. PressBox would also like to give a special thank you to the Baltimore Marriott Waterfront for hosting our numbers drawing event this year. No company or person may enter this pool to win prize money directly. All proceeds are awarded to the charities in the names of the companies or persons purchasing the winning boxes. For information on all rules and regulations, e-mail fanmail@pressboxonline.com. PressBox Thanks Our 2012-13 Charity Block Pool Participants! When Baltimore beat San Francisco Feb. 3 in New Orleans, Charm City charities also became winners as PressBox's third-annual 100 Block Charity Pool once again raised $14,000. The final score of the big game in New Orleans was Baltimore 34, San Francisco 31. As you can see in the 100 Block Charity Pool grid: Computers, Inc. won $3,500 for St. Elizabeth's School (first quarter), Mr. Basement won $3,500 for Special Olympics Maryland (second quarter), Royal Farms won $3,500 for Living Classrooms Foundation (third quarter) and Myers Solomon Realty won $3,500 for Camp Shoresh (fourth quarter). Click here to see the 2012-13 100 Block Charity Pool grid (pdf). PressBox Thanks Our 2011-12 Charity Block Pool Participants! The final score of the big game in Indianapolis was New York Giants 21, New England Patriots 17. As you can see in the attached 100 Block Charity Pool grid, we had three winners instead of four this year, as the block owned by GBT, playing for Esophageal Cancer, won both the first and second quarters at New York Giants 9, New England 0 at the end of the first, followed up by the same matching digits with a different score -- New England 10, New York Giants 9 -- at the half. To recap, GBT won $7,000 to help Esophageal Cancer, with $3,500 going to Chesapeake Urology's Great Prostate Cancer Challenge and $3,500 to the LifeBridge Health Systems from the folks at Bond Distributing.